In east-central Kentucky you’ll find the Red River Gorge—29,000 acres of sandstone cliffs, rock shelters, waterfalls and natural bridges that attract close to a million adventure-seeking hikers, backpackers and rock climbers a year. You’ll also find the Wolfe County Search and Rescue Team—30 men and women who make it their job to rescue those hikers, backpackers and rock climbers when things go wrong in this rugged terrain. To put it simply, the WCSART’s mission is “getting people out alive,” said Drew Stevens, the team’s coordinator. We’re proud to call this group a TeamSnap customer. The Wolfe County Search and Rescue Team conducts 50 missions per year … and that’s on a slow year! 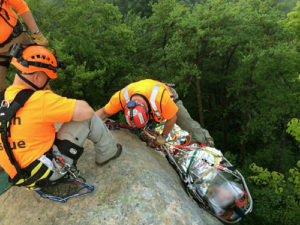 The WCSART is a team of volunteers who specialize in conducting any sort of wilderness search and rescue in the Red River Gorge area, including searching for lost hikers, treating and carrying out someone who broke a leg on the trails, or conducting cliff rescues when someone falls off a face and has sustained major injuries. They conduct 50 rescue missions per year—on a slow year. The numbers go up from there. The group is composed entirely of volunteers and only get $1,400 a year in funding! Consider making a donation. One that can’t be described as such happened a couple years ago, when a group of teenagers who weren’t trained in rock climbing set out to climb a 60-foot cliff. One flipped and fell on his back, breaking multiple bones. When members of the WCSART reached him, he was vomiting blood and floating in and out of consciousness. The team got him out of the canyon to a waiting helicopter that lifted him to the hospital. Two years later, he’s now learning to walk again. You’d think such a valuable operation wouldn’t be so underfunded, but like so many other parks initiatives, that’s the case. The WCSART can only count on $1,400 a year for equipment, training and whatever else they need; the rest of their budget they get through donations and grants. They don’t even have a building to call their own. So when a call comes in, Stevens and the group’s other leaders have to act fast to mobilize a distributed team with members who have the skills pertaining to that particular mission. That’s where TeamSnap comes in. They looked into other apps and programs geared more toward search and rescue teams but found them to be too expensive. They found TeamSnap’s roster and messaging tools to be the right fit at the right price for their dispatching needs. The group uses TeamSnap’s roster feature to track who has what skills and to easily keep track of each member’s most up-to-date contact information. When a call comes in, mission leaders can find the volunteers with the right skills to fit that specific mission and then use TeamSnap’s messaging abilities to mobilize those members on the fly. The group uses even more of TeamSnap’s features to help schedule training. On behalf of TeamSnap’s nature-loving employees, thank you for your efforts, Wolfe County Search and Rescue Team! To support the WCSART, please visit www.wcsart.com/donate. Stephanie Myers is the Content Manager for TeamSnap, managing such content as this blog, the TeamSnap newsletter and much more. When she’s not being the boss of content, you can find Stephanie playing lawn games or working on her 95-year-old craftsman home in Memphis, Tenn.